Via Turkey Purge – At least 144 people affiliated with Turkey’s Gülen group were detained in two months while trying to flee to nearby Greek islands, according to state-run Anadolu news agency. The Greek authorities are deporting migrants on the Greek islands to Turkey in an expedited process – raising concerns over potentially illegal and prejudiced practices, reports Matt Broomfield. Via The New Arab – Refugees from so-called “undesirable” countries are being jailed upon arrival to the Greek islands, before being put through a summary fast-track asylum procedure and returned to detention in Turkey within a matter of weeks, it has emerged. Individuals from North Africa and South Asia are being singled out upon arrival, due to a policy that has been described as racist and illegal. Returned and Lost: What Happens After Readmission to Turkey? Via University of Oxford – Turkey was regarded as a safe third country for the purposes of the EU-Turkey Statement and on September 22, 2017, the Greek Council of State approved decisions of earlier Appeals Committees, which declared Turkey a safe third country; thus paving the way for more returns. However, little is known about the reception conditions of the migrants and asylum seekers who have been readmitted to Turkey. To fill this knowledge gap and to achieve a better understanding of the impacts of the Statement, the Vrije Universiteit Amsterdam Migration Law Section conducted research that was funded by the Dutch Council for Refugees. The following article is a summary of a report by Orcun Ulusoy for Free University Berlin, which you can find here. For 14 days, refugee activist Arash Hampay has refused food. On the Greek island of Lesvos, he sits on the central square of the town Mytilini surrounded by shops, cafés and tourists, presenting a sign stating “Refugees are not Criminals”. 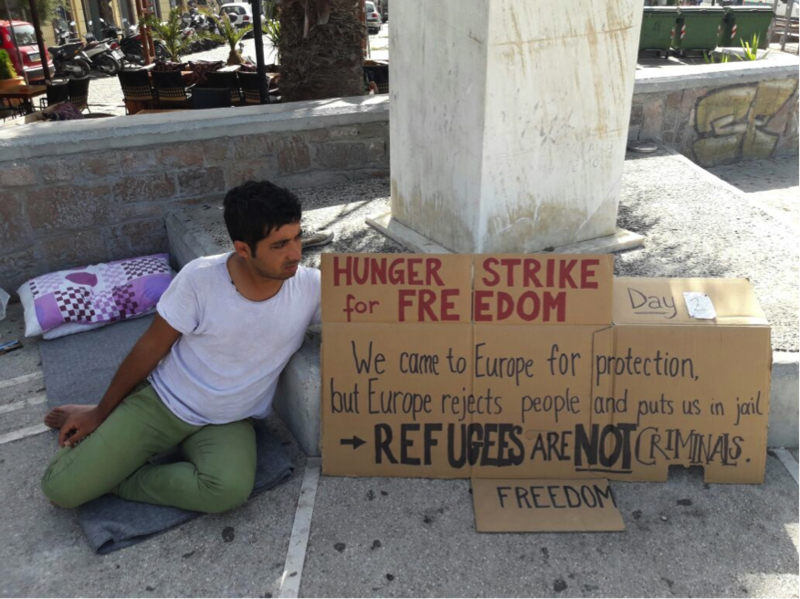 Surrounded by tourists and cafes, Arash Hampay has started a hunger strike on the island of Lesvos. Photo by: Lorraine Leete, Legal Centre Lesbos. HarekAct aims at contributing to a critical and analytical knowledge production on the question of migration in general, with a focus on the case of Turkey in particular. The blog serves as a collective platform to monitor, increase and share various debates and information on migration, asylum and border issues primarily in Turkey as well as on the general European context as far as it is connected to Turkey.